Since there isn't a way for me to post all the outfits I've made on my shop's site, I thought a blog would be a great place to display them! I hope they'll give you some great ideas for a creation of your own! 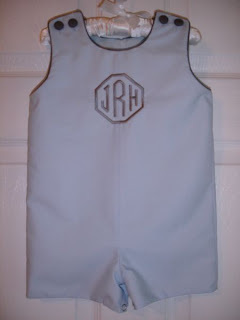 This Jon Jon was done for a customer's son to wear at a wedding they were attending. She wanted him to match the wedding party so we did it in Watercolor Blue (#232) with a Grey Silver (#320) piping and monogrammed in the diamond with boarder font. 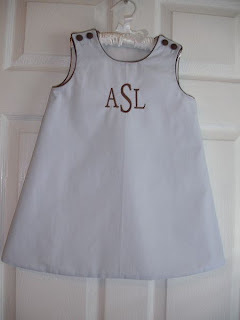 This precious longall was done for a great and loyal customer for her son to wear this winter. 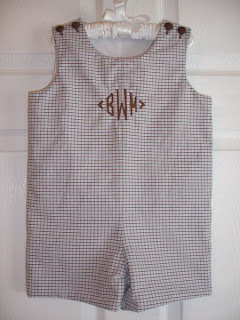 It is done in a Chocolate Brown Houndstooth (#088) and monogrammed in a block font. Don't you just love Brother/Sister outfits? They were both done in a Light Blue Micro Stripe (#265) with Chocolate Brown (#245) piping and monogrammed in a block font. This outfit makes me think of summertime fun! 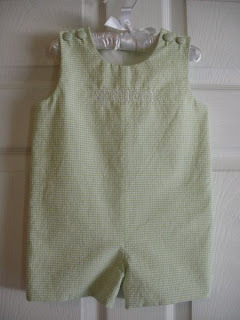 It is made in a Lime Green Seersucker (#179) and monogrammed with a block font. I've been wanting to make my own son something out of this fabric so I was so pleased when a dear customer thought as much of it as I did! 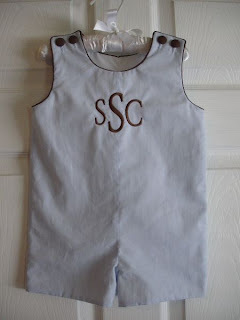 This outfit is done in a Light blue and Chocolate Brown Check (#088) and monogrammed in the diamond font. I'm not sure why but every time a do an dress in pink and chocolate I immediately think of Neapolitan ice cream! 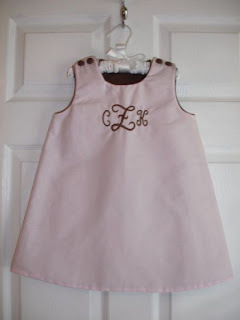 This sweet little dress is made in a Ballet Pink (#240) and lined and piped in Chocolate Brown (#245). 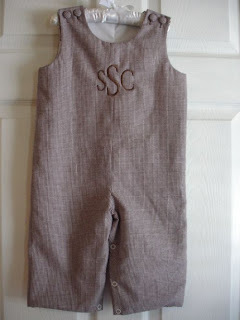 It is also monogrammed in the interlocking script font. There are so many reasons why I love this outfit! It's not just because it's two outfits in one but because it pays homage to my Alma Mater (WAR EAGLE!!!). 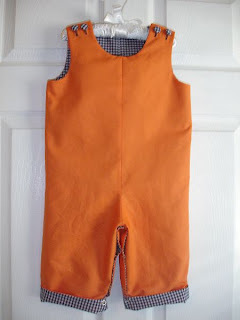 It is done in a Navy Blue Gingham (#046) and lined in Orange (#297). 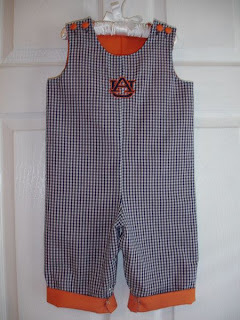 *I'd like to note I did not sell this outfit on my site but made it for a family member as I am not licensed to sell the AU logo.